Volunteers have worked in New York (pictured) and New Jersey since Hurricane Sandy left many people along the coast with heavily damaged or destroyed homes. Grier Cash is the Samaritan’s Purse office manager and volunteer coordinator in Ocean County, N.J. The office has been helping victims of Hurricane Sandy since the storm hit in October 2012. Samaritan’s Purse volunteers labored through a cold winter here in Ocean County, N.J., but spring has finally bloomed. We praise God for the work that has been done over the past several months, as volunteers have continued to faithfully serve this hard-hit area 19 months after Superstorm Sandy. 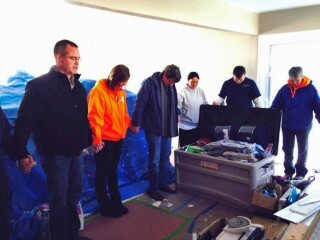 Several weeks ago, our volunteers worked in the home of Trey and Megan Strickland. The Stricklands’ house was flooded with more than two feet of water during Hurricane Sandy. Trey, Megan, and their three teenage children have been displaced since the storm and have been living with extended family in a neighboring town. The Hope Chest made the move back into their home less stressful for the Stricklands. When the family ran out of funds to pay contractors earlier this year, Trey decided to tackle his unfinished home by himself, working full time during the day and attending to the needs of the home in the evening. That is where Samaritan’s Purse stepped in. To help bear the burden of labor, we responded with a crew of volunteers to help with the finishing touches on the remodeled home—putting up drywall, painting, tiling, and completing trim. Trey and Megan served beside our volunteers to make their home move-in ready. As part of Samaritan’s Purse’s effort to work alongside local churches in the area, our staff and volunteers were able to participate in a special Hope Chest presentation made to the Stricklands by Jersey Shore United. Jersey Shore United is a ministry that formed shortly after Hurricane Sandy to bring local bodies of faith together to help assist storm survivors with various needs. They exist as a vehicle for local churches to respond in their own communities. The ministry gives Hope Chests to families throughout the Jersey Shore area who are preparing to move back into their homes. The chests contain everything needed to be 100 percent operational in a new home on the first night—bedding, bathroom essentials, cleaning supplies, dishes, pots and pans, toaster and coffee maker, light bulbs, batteries, etc. The families are also presented with a Bible, a personal letter, and an illustrated plaque that explains the Gospel. The Hope Chest given to the Strickland family not only equipped them with material essentials but it also gave us opportunity to share about the true hope we have in Christ. This family is now one step closer to making their house a home again.